When I saw the little fox face on Shayla Morrigan’s design, The Vixen Socks, I immediately imagined them ringing a child’s sweater yoke. It didn’t take long for me to decide we needed more than faces—we needed the entire fox! And so I’ve used a variety of textured stitches to “draw” a friendly little fox, completely redesigning the face while I was at it, to create a more 3-dimensional image. 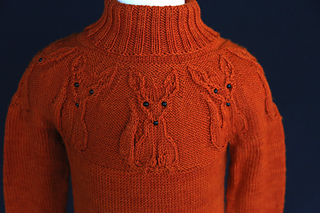 These foxes look like they want to jump right off the sweater to play. 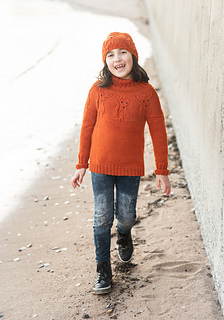 Designed with about 3–4” of ease, this will be a roomy sweater for active play. 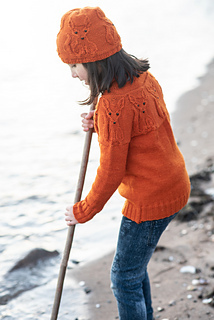 The body and sleeves of this sweater are simple to work in the round from bottom up. After joining for the yoke, plan to spend some focused knitting time working the intricate fox motifs. If the wide variety of stitches weren’t enough to hold your interest, you’ll find that you can’t wait to see how the fox works up and soon you’ll be on to the simple ribbing for the neck.